Neither one stuck their foot in their mouth. Very much not up to expectations. Though I guess that technically is a win for Palin, since she hasn't exactly had a stellar time in the media as of late (not that Biden has exactly been stunning people). She most definitely outperformed expectations. I still stick with my status from Facebook, "Dan is I suppose I should be a good DC person and at least watch the debate... though who really cares about the VP? I vote for the President, not the VP." 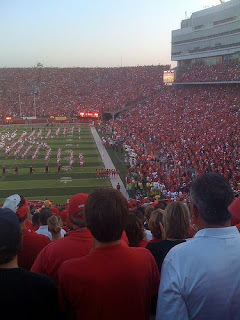 I was lucky enough this past weekend to attend the VT/Nebraska game at Memorial Stadium in Lincoln, Nebraska. It was quite an experience. 88 thousand people were in attendance, maybe all of 6-7k of them were Hokie fans. But we represented, almost all wearing Orange (some wearing the more camouflaged Maroon) and apparently we were far louder than any visitor team that any of our neighbors could recall (my family was sitting almost opposite to the Hokie corner and you could clearly hear the cheering and chanting from across the ginormious stadium). Really, the game was a sheer, grip the edge of your seat game. While the Hokies grabbed the lead early with a Safety and a quick TD from an interception, there was no moment that night that that I felt completely comfortable with victory (probably due to my having seen the Hokies blow it so many times at this point when they do get ahead). Other than the football game I was quite impressed with Nebraska (not that I would live there or anything... far too pedestrian unfriendly for my taste) but it has been 11 years since we went out there. I saw a number of relatives that I haven't seen since then and was actually pretty impressed with the way that they have developed downtown Omaha.